Charles Eames (American, 1907–1978) and Ray Eames (American, 1916–1988), DCW (Dining Chair Wood), 1948. Manufactured by Evans Products Co, Distributed by Herman Miller Inc. Molded birch plywood, rubber shockmounts. Milwaukee Art Museum, Gift of Kenneth and James Kurtz M1976.66. Photo credit John Nienhuis. Late in 2010 I advocated that the Museum accept a Ray and Charles Eames DCW (“Dining Chair Wood”) into the Permanent Collection. No big surprise there, as this bent plywood chair is the iconic work of two of the most influential 20th-century furniture designers. It is a must-have for any design collection! However, this chair wasn’t the Museum’s first Eames object. The Collection already included one DCW chair (pictured at left), a 1946 folding plywood screen, and several examples of the World War II U.S. Navy leg splint that bolstered Ray and Charles’ experiments in complex two-way bent molded plywood. So why an additional example of the DCW? And, why this one? Well, to tell the truth, I put in to motion the Museum’s acceptance of the DCW based on a hunch…and I just might be wrong. Charles and Ray Eames, DCW (Dining Chair Wood), 1948. Manufactured by Evans Products Co, Distributed by Herman Miller Inc. Molded birch plywood, rubber shockmounts. Milwaukee Art Museum, Gift of Janet and Marvin Fishman, M2011.46. Photo by the author. This additional version of the DCW (pictured at right) came to us from a situation where we had no information from its owner about details of its past or how it was acquired. There was little documentation, and we had to act quickly. I saw that the chair had a maker’s label on the bottom, which is encouraging. I also saw that this particular chair, as you might be able to make out in the photo, showed remnants of a red stained or painted surface. This red stain was either a very good sign (original!) or a very bad sign (someone later added it). But, my brain linked together “red” and “Eames” with the word “rare,” so I felt good about this chair’s place in our permanent collection. I’ve since confirmed that the DCW (and its sister the DCM-“Dining Chair Metal”), when first manufactured by the Evans Products Company (Venice, California) from 1946 to 1949, were available with a red aniline dyed plywood, like this example in the collection of the Yale University Art Gallery. These original red examples are indeed very rare. However–and here we return to the part where I might be wrong–I’m still not completely sure that I have one here. When you look at the bottom of this DCW (see below) you’ll see that there is a harsh red paint applied later around the affixed label. I think it was applied later because to my eyes, the paint is slightly layering over the label itself. On the other hand, the rest of the surface appears to be more “stained” but very faded. When and why was this red paint added around the label? Or was there once paint all over the chair that was later removed, excepting around the label? Is this an original red aniline dyed example… or not? Charles and Ray Eames, DCW (Dining Chair Wood), 1948. Detail of underside. Manufactured by Evans Products Company, Distributed by Herman Miller Inc. Molded birch plywood, rubber shockmounts. Milwaukee Art Museum, Gift of Janet and Marvin Fishman, M2011.46. Photo by the author. When it comes time to exhibit or write further about this chair, I’ll call in the expertise of our conservation staff to see what we can learn from a materials standpoint. In the meantime, I’ll concentrate on the label itself. For more information on situating that particular label and the information it contains, I turned to a trusted source on all things Ray and Charles Eames: the “Eames Office.” Using their thorough website, I could compare the Museum’s newly-acquired chair with their original 1948 LCW on the Eames online furniture raisonne, without even leaving my desk. I could confirm that the Museum’s chair has the “transitional label” just like the one on the bottom of the 1948 LCW in the Eames collection chair. 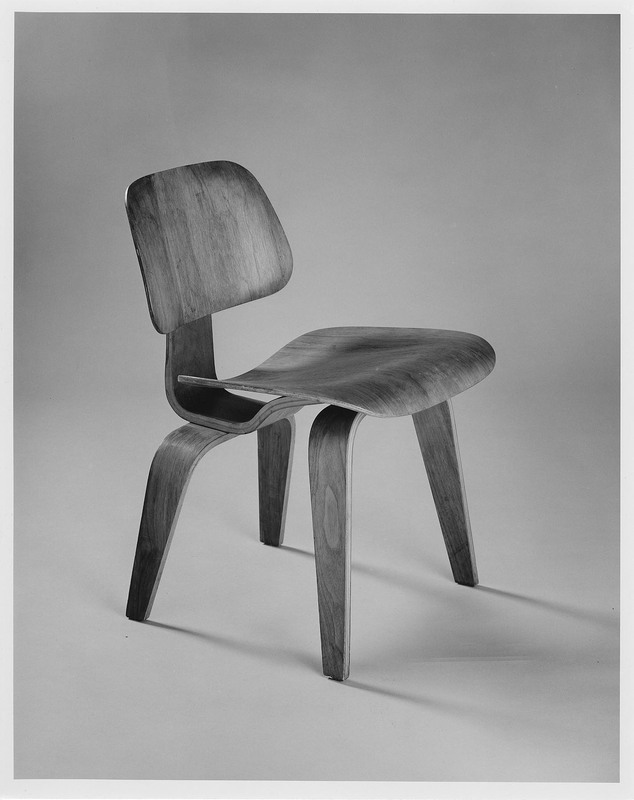 Charles and Ray Eames, DCW (Dining Chair Wood), 1946–56. Manufactured by Evans Products Co, Distributed by Herman Miller Inc. Molded birch plywood, rubber shockmounts. Milwaukee Art Museum, Gift of Kenneth and James Kurtz M1976.66. Photo by the author. 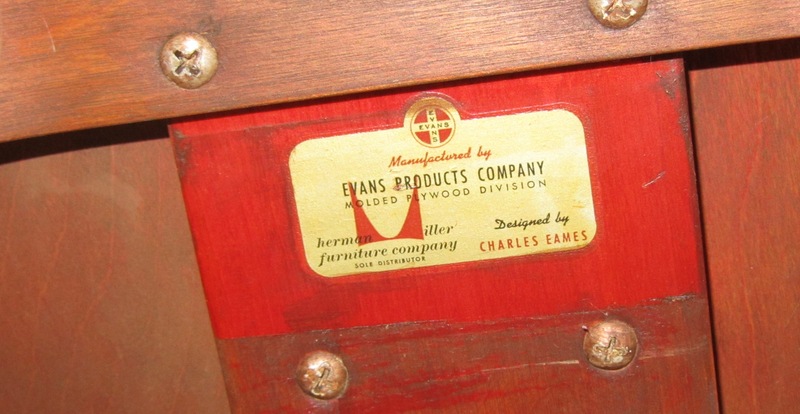 This type of label, mentioning both companies, means it was manufactured by the first mass-producer of the design, the Evans Products Company in California. But, this particular label also tells us it was made late in that period, during the transitional period when the chairs were distributed by Herman Miller out of Michigan. This dates the chair to almost exactly 1948. After 1949, Herman Miller Company was the sole producer and distributor. As another comparison, I’m showing at left the underside of the other DCW (pictured at the top of this post) in the Museum’s collection. It has none of the red stain issues (or possibilities! ), but its label is not in great condition. If you look closely, it is the exact same “transitional label” as on the newest DCW in the collection. Also visible in this photograph is the 5-2-5 arrangement of screws often used to help distinguish between eras of Eames chair manufacture. I’ve learned that if you see the screws arranged like this with 5 attaching the front legs, 2 securing the seat at middle, and then another 5 at the rear holding on the rear legs, you have found a chair produced at the Evans Products Co (1946-1949). After Herman Miller produced the chair for about a year or so, the bolt configuration changed to 5-2-4. This post, like much other research, is a work in progress. If you have additional clues about the red aniline dye on this chair, please let me know through the comments section. 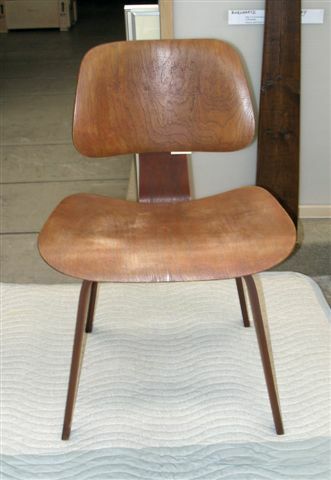 This entry was posted in Art, Curatorial and tagged 20th century art, Charles Eames, Design, Eames, From Museum Storage, From the Collection, Furniture, Herman Miller, Midcentury Modernism, Ray Eames. Bookmark the permalink. Both of those chairs are cool. 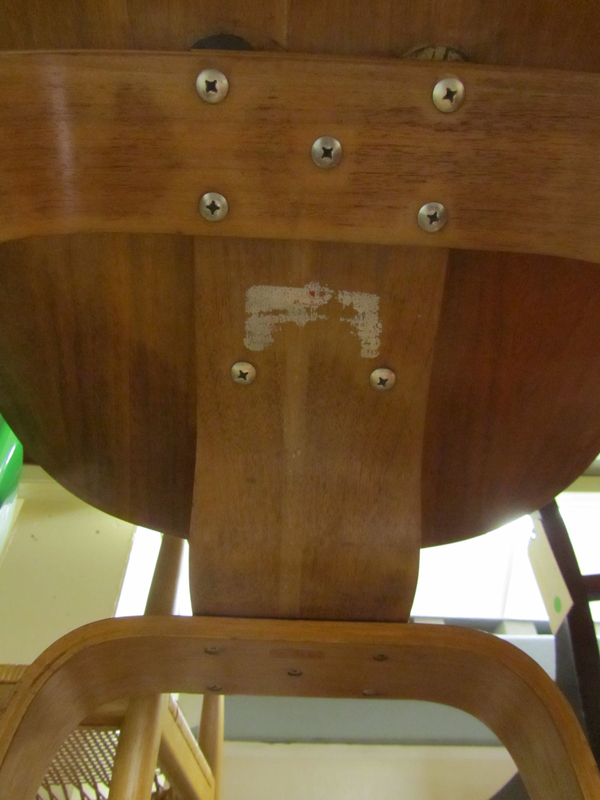 The chair with the remnant label looks to be Walnut, and looks like someone gave it a partial refurb-causing the damage to the label. The Red chair appears to have been originally red. It looks like somebody also tried stripping the red chair, and made an effort to avoid the label area, for common sense reasons[thankfully]. It appears to me that the chair was stripped, with a common hardware store stripper. It looks like the brush strokes are over top of the deep red near the label area. And it looks like there is crusty residue on top of the screws that go through the spine near the label. Many collectors are strict about disassembling these chairs. However, I do not see the wisdom. You will find more information about the chair if you unscrew the seat. Make sure you use a large= number 3 phillips hand held screw driver. It is also important to loosen and tighten all of the screws that go into the shock mounts quarterly, even if you choose not to unscrew the chair completely. The expansion and contraction [from humidity, and temperature] of the individual parts drives stress into the shock mounts, which are old and brittle. Otherwise, you’ll arrive at the museum one day to find the seat back has fallen off. Also, try to avoid lifting the chair by its seat back. Lifting by seat back is the common cause of shock mount failure at the seat back area. Other notable features are that the chair appears to be Birch veneer[see the flame pattern to the seat back], which was the choice for Red, [whereas, Ash was used for Black], and it appears that there is remnant red dye in the grain. You can see what looks to be a red river to the right of the label. This chair surely was factory red. It’s my guess, based on the dozen or so red chairs I’ve seen, that the dye was applied after the chairs were assembled. It’s often we find chairs which are faded to almost gray, and have remnant red on the underside of seat, and have red die on the shock mounts. We often see wax paper, or some sort of paper, in between the mounts and the seat. It may be that the dye was mixed on the spot, and there was a color range to it. And, the intention was to make sure all parts were covered in dye from the same bucket, rather than dye a bunch of legs on one line, from one bucket, and spines on another line from a different bucket, and have them not match at assembly. [It’s also my *guess* that the dye was applied with a rag, rather than a brush. So, I’d also think that any brush strokes you see on this chair are from the stripping process].Often we’ll find that the spine will have bare blonde birch where the front leg attaches, and the same with the front leg. The back leg was glued, and screwed, but if the glue has come loose, we’ll see the back leg and spine bare blonde at the joint. But, interestingly, the labels were put on after the red dye. You can see the red dye under the label in your example. It would lead one to conclude that stock chairs with labels were not taken out of a box and dyed red. It’s possible that new old stock parts were assembled, and dyed to order, and the label was put on after color. But, we don’t normally see original black or red chairs with dye over the label. It’s my opinion that your conservator team should mix up a batch of dye which matches the color on the underside of the chair the best, and re-dye the chair. Many collectors may cringe at this. But, I think for museum-education purposes, it is more interesting so see what the original chair would have looked like=Deep Bright Red, rather than the folk-art preference of someone celebrating the bicentennial. Cheers. Thank you sincerely for this thoughtful and informative reply. I’ve printed out the information for the Museum’s object file. I am thrilled to hear from someone that has obviously acquired a lot of information about this issue, and more so to learn that my “hunch” that we should take this chair into the collection is correct. Thank you for reading out blog! My mother has one of the LCW chairs but I need to see if there is a label and what the screw configuration is. I know she inherited it from my great-aunt who purchased it originally. I remember it sitting in the den and no one ever really sat in it. Now my mother has it in a spare bedroom. It is in perfect condition and has never been altered. Nice to know where I can go to get information about it now.